It all starts with the dough! Let’s just say that fresh homemade pasta is one of the greatest creations possible to make at home. It seems so overwhelming and impossible; something that is only a treat at our favorite Italian restaurant. Let me tell you this is just a myth. Making fresh pasta dough at home is actually really easy. Having a pasta roller isn’t even completely necessary, though it makes things much easier. After you have made pasta a few times, you will wonder why you have been missing out for so long. The first time I built up the courage to make pasta dough at home was when America’s Test Kitchen came out with their “Pasta without a Machine” recipe. No pasta roller or machine was required, and since I didn’t have one, this really caught my interest. Everything goes into the food processor and is then rolled out by hand. I will confess that I only made it without a machine once as I had received the Kitchenaid pasta roller attachment as a gift soon after. 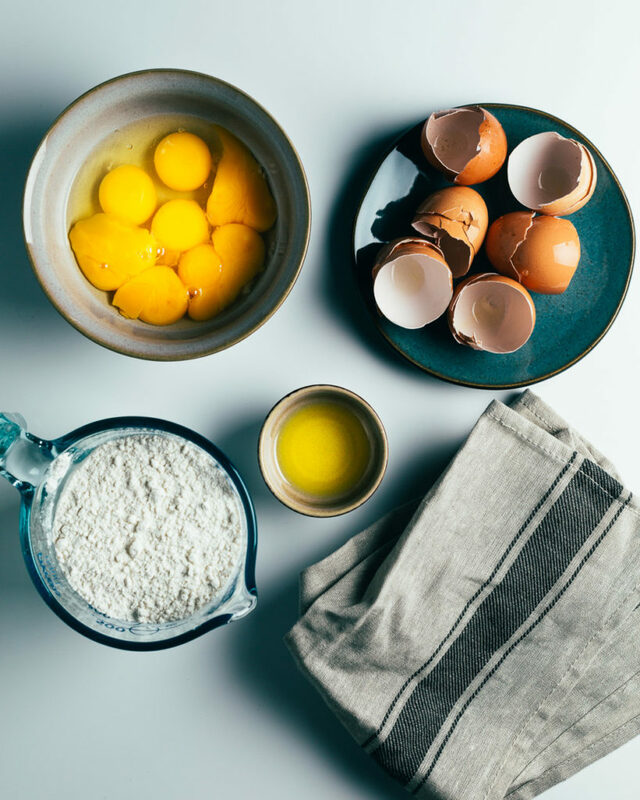 It all starts with three basic ingredients: all-purpose flour, eggs (more yolks than whole eggs) and olive oil. That’s it, really! This recipe is the easiest multi-purpose pasta dough that I have made so far, and some of the best dishes I have ever eaten have come from it. There are countless different methodologies, recipes, techniques and ingredients out there when it comes to making fresh pasta. There are different recipes for ravioli, extruded pasta, etc., which I will be getting into in later posts. This recipe is the one I would recommend starting with as it is fairly foolproof and requires little labor. 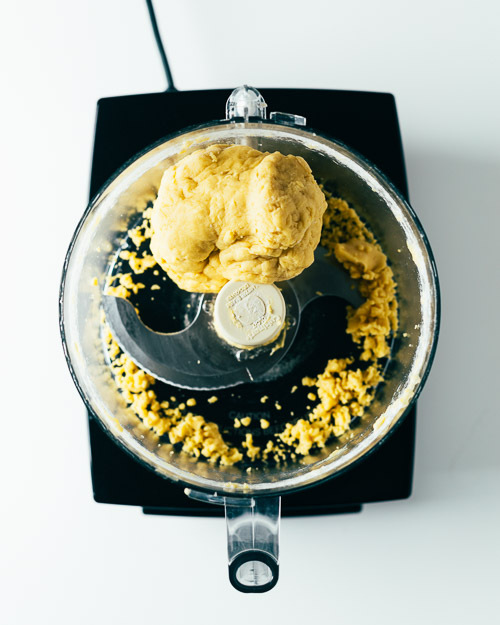 They all get pulsed to combine in a food processor to make a perfect ball of fresh pasta dough. 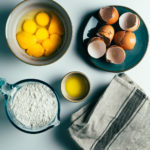 Depending on a few variables, such as local humidity, the size of eggs and specific flour brand; the dough might be a little too tacky or too loose. 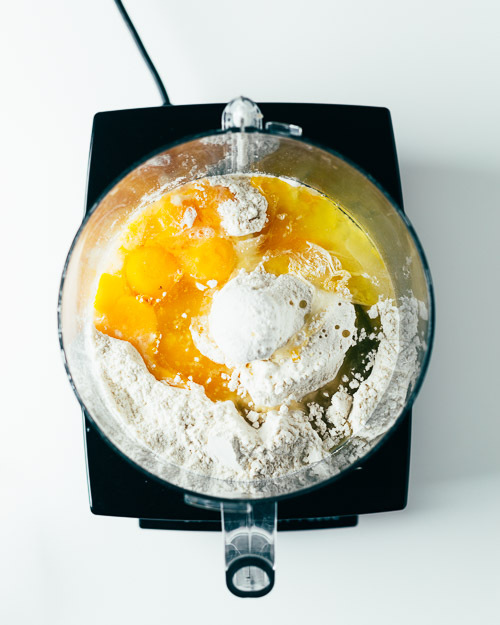 It is really easy to fix by either adding a little flour or water (depending on which you need to fix) and pulse the food processor again. You really aren’t going to mess the dough up by pulsing more. Think of how long dough is usually kneaded on the counter. It should look like this out of the food processor. Push it all together and knead for a few minutes on a dry surface to form a 6 inch cylinder (pictured below). The dough cylinder is wrapped in plastic wrap and set aside to rest at room temperature for a minimum of 1 hour and up to 4 hours to relax the gluten before it is rolled out. That’s it! 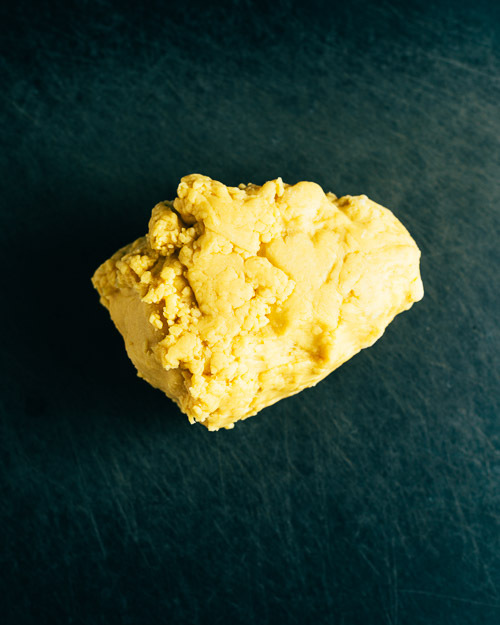 The basic homemade pasta dough is that simple. I will be referring back to this recipe in future pasta recipe posts that use fresh pasta. 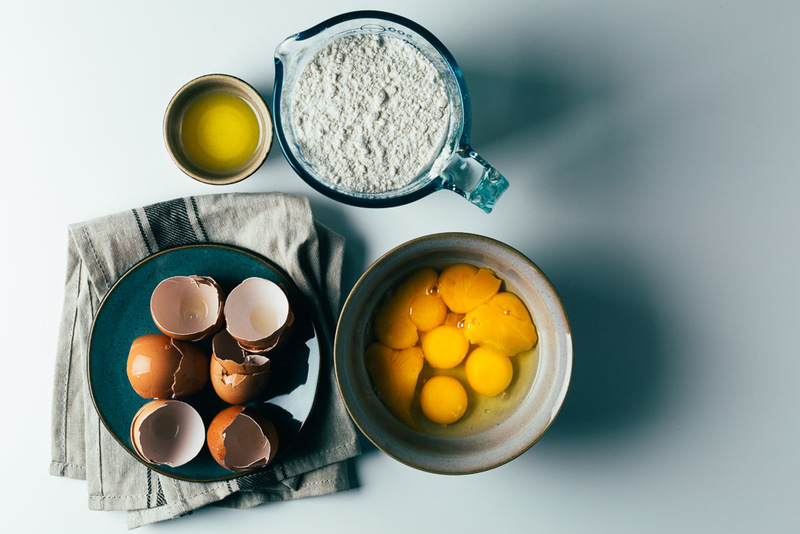 Process the flour, eggs, egg yolks and olive oil in a food processor for about 45 seconds, until it forms a cohesive ball. The dough ball should feel just slightly tacky to the touch. If the dough feels sticky, you can add 1 tablespoon of flour at a time (up to 1/4 cup). If the dough does not come together, you can add up to 1 tablespoon of water, 1 teaspoon at a time. Pulse the processor for an additional 30 seconds after you have made your adjustments. 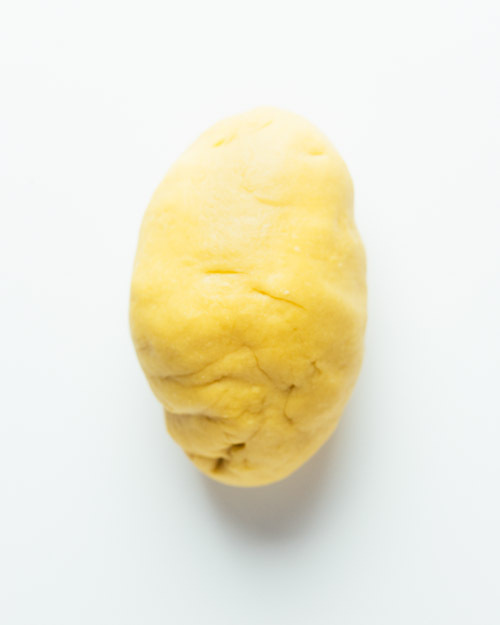 Knead the dough ball on a dry surface for 1 to 2 minutes and bring it into a cylinder shape that is about 6 inches long. Wrap the dough tightly with plastic wrap and set aside for a minimum of 1 hour and up to 4 hours to relax the gluten before the rolling the dough out. You can refrigerate the dough before resting if you need longer, then take it out of the refrigerator and rest at room temperature for 1 to 4 hours. Cut the dough cylinder crosswise into 6 equal pieces. Working with 1 piece of dough (and covering the rest with the plastic wrap), dust with flour, then press it into a square. Run the dough through the pasta roller at the largest setting. Fold the sheet over into thirds, then rotate 90 degrees and run it through the pasta roller again at the largest setting. Continue to run the pasta sheet through the roller at a smaller setting each time until the desired thickness is reached. If the dough starts to stick, you can dust with more flour. Place the rolled pasta sheets on kitchen towels and leave uncovered for about 15 minutes, or until the edges start to dry ever so slightly. Cut the pasta sheets to the desired noodle or use to make ravioli. Cook the noodles within the hour in heavily salted water for about 3 minutes. This recipe is based on the America's Test Kitchen's “Pasta without a Machine” recipe ingredients, though I do use a pasta roller to roll out the dough. Excited about this new site! You make it sound so easy.